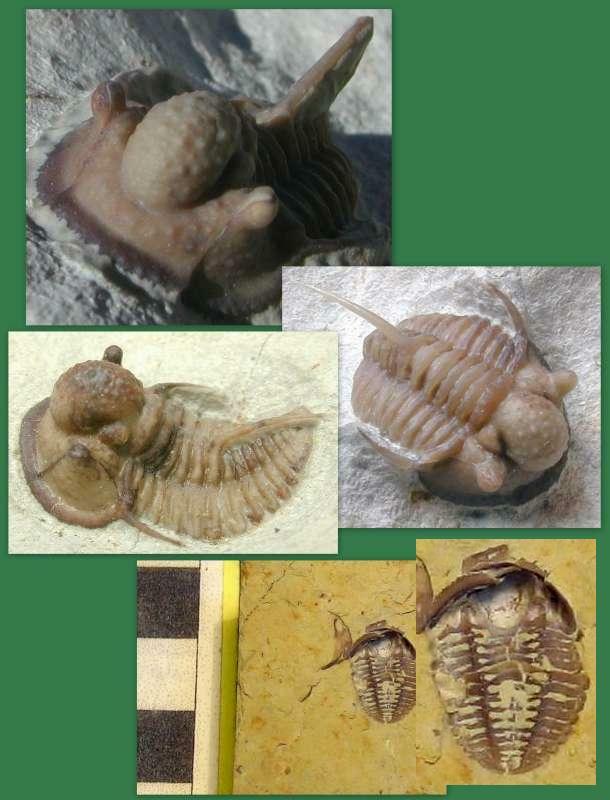 At Black Cat Mountain these trilobites include species of Cyphaspis and Maorotarion described and illustrated consecutively below. This species was named after Bob Carroll, who provided specimens for description. The genus is generally characterized by the presence of the noticeable spine emerging from the sixth thoracic segment, the bulbous glabella and the long spines terminating the lateral corners of the free cheeks. Several specimens of Cyphaspis carrolli are found each year, but their intact preparation is quite difficult. Notice all of the tubercles on the glabella? Those should terminate in hair-like spines, but these are erased by the air abrasion process used to remove the matrix from the fossil. Bob has indicated to me that this species is actually covered by fine hair-like spines, especially on the large thoracic spine, but these are only visible under his stereo microscope during the preparation process. At the bottom of the collage below is an unusual occurrence, a view of the ventral surface of this species. The adjacent inset image shows it larger for easier viewing. All photographs were taken by G.P. Hansen, except the right most one, which was provided by John Moffitt and Neal Immega. While Cyphaspis carrolli is found several times each year at Black Cat Mountain, rarely does a pair of them appear as in the association shown here. 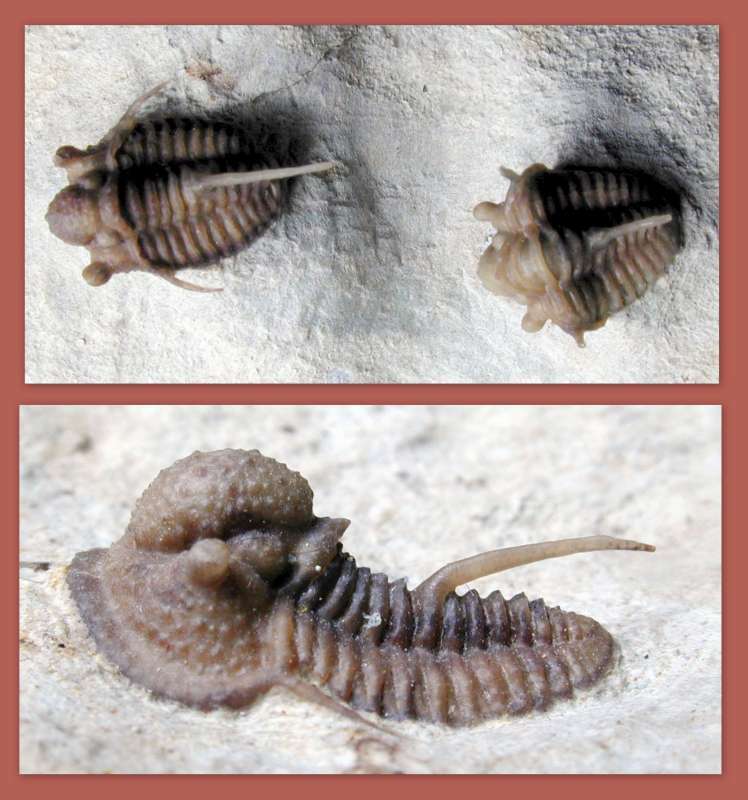 Below the photograph of the pair, I am showing a lateral image of the "leading" specimen, which allows a nice view of the thoracic spine and the outline and tubercular structure on the head of this trilobite. The photographs were provided courtesy of Sam Stubbs and Neal Immega. Specimens of Maorotarion axitiosum, usually well under 1 cm in length, are occasionally found as individuals. 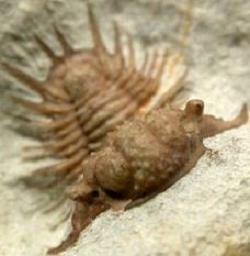 However in 2008, two pieces were found with multiple specimens of this tiny trilobite on each. 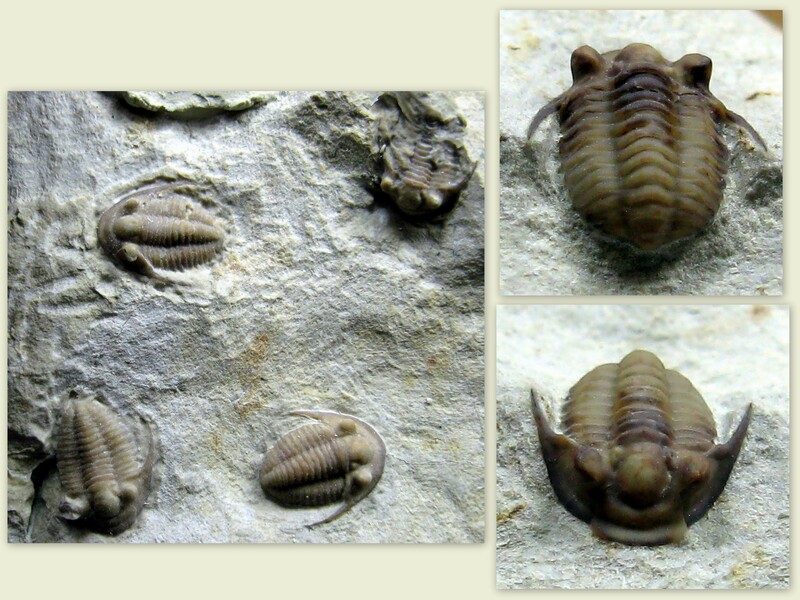 Trilobite associations are always interesting for the potential social information they may convey. See for instance an article on this phenomenon in LiveScience where specialists speculate on their sexual and migratory habits. The photographs of these shown below were taken by G.P. Hansen.